A single comprehensive reference for nursing leaders, leadership organizations, nursing clinicians, and educators, Nursing Leadership is the only compendium of nursing terminology in existence. 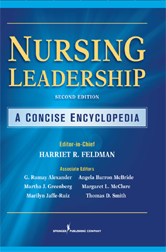 Written by eminent nursing professionals, it provides descriptions of prominent individuals in nursing, information regarding nine leadership-related topics, and current trends in nurse leadership.This second edition has been expanded to encompass 80 new entries and revisions or updates to all original entries. It provides an extensive overview of current leadership issues including theories, characteristics, and skills required of nurse leaders in today's complex health care system. Highly respected contributors include Claire Fagan, Beverly Malone (NLN CEO), Polly Bednash (AACN CEO), Patricia Benner, and many others. For ease of use this new edition contains both alphabetic and thematic indexes, extensive cross-referencing, and print and web references for each entry.